6/9/00 – Sean had soccer training … he really enjoys it. 10/9/00 – Sean watched The World’s Most Amazing Videos, which is now banned in our house due to excessive nastiness and violence. 13/9/00 – Pauline read Harry Potter to the kids, with the result that they were scared and went to sleep in our bed. 20/9/00 – Sean watched football on TV, enthusiastic about Arsenal. 23/9/00 – We got up around 8.45; the kids had a horse-riding lesson at 9.45. I went along – they did very well, and did some trotting … Pauline and the kids headed for Dublin – Sean wanted to buy a Game Boy and Pauline wanted to buy glass … They got home around 6 – Sean complete with Game Boy, and very happy … Sean, Susanna and I rounded up the ducks and hens and put them in Maire’s shed for the night. 24/9/00 – Sean hurt his finger playing basketball, and it was very sore. 25/9/0 – Sean came home with his finger strapped by the doctor – it’s probably just bruised … Played pool with Sean. 1/10/00 – Sean and Susanna played a game they also played last night, which involved stuffing pillows into their pyjamas so they looked very fat … AJ and Andy called, and played Monopoly with the kids and Pauline … We sat in front of the fire and watched a film called Volcano, which was quite entertaining. Sean loved it. 3/10/00 – Sean had his first music lesson of the school year. 5/10/00 – Siobhan dropped the kids home around 8 – Sean was shattered, and very upset because we wouldn’t let him watch a James Bond movie, but calmed down and apologized – bed was the best place for him. 16/10/00 – We got the kids out to school – they wore their new uniform tracksuits for the first time. Sean decided he didn’t like his, and made a huge fuss about it – he was very tired … By the time Sean got home, he loved his tracksuit. 18/10/00 – AJ, Sean, Susanna and Romy went up the fields; I went up part of the way. A little later I went up to get them, as it was getting towards dark and there was a bull in one of the fields. 26/10/00 – Sean and I watched some football; we all listened to Susanna reading a whole book – she’s got very good at reading. 29/10/00 – Pauline and the kids sorted out their Hallowe’en costumes. In the afternoon they went to Erika’s, where Susanna proved to have a remarkable talent for ducking for money. 9/11/00 – Sean and I played ‘defending’, a very physical football game, in the hall. 13/11/00 – Played chess with Sean. 17/11/00 – Sean and I had four games of chess – he beat me in the last one, which was a very big thing for him, and it’s the first time he’s beaten me. 18/11/00 – I had a few more games of chess with Sean, in one of which he beat me. 23/11/00 – Fluffy caught a mouse outside, and played with the unfortunate creature for a long time before it died – Sean and I had at first tried to rescue it. 28/11/00 – Sean and I had a game of chess, which was hard fought – he burst into tears when I regained my queen, and was inconsolable for some time. Sean looks like he’s having a ball in this photo Brendan! 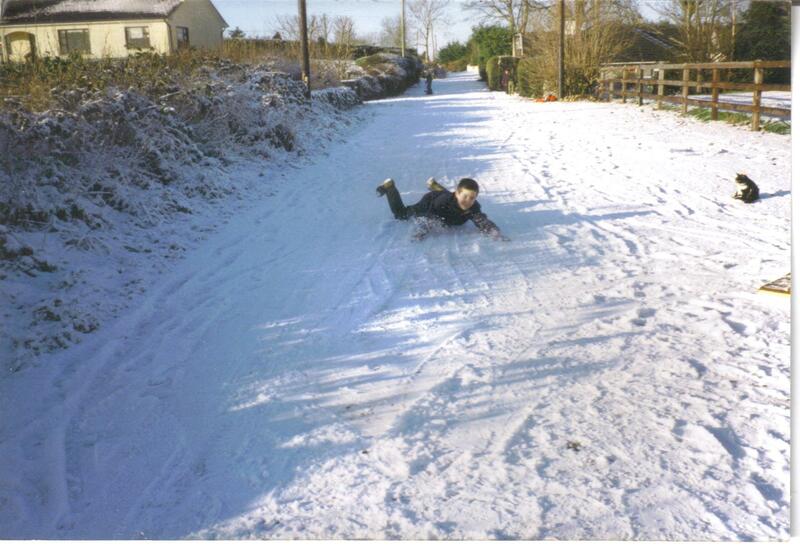 I can just hear the squeals of delight as he flies along the ground and bowls Pauline over as she takes the picture! Hi Dave … yes, sprinting along and throwing himself on the road – watched by a cat. No toboggan required. They always had fun in the snow.